In this tutorial, you'll learn how to use the pandas groupby operation, which draws from the well-known split-apply-combine strategy, on Netflix movie data. Netflix recently released some user ratings data. I wanted to ask a straightforward question: do Netflix subscribers prefer older or newer movies? Intuitively, you want to split the dataset into groups, one for each year, and then to compute a summary statistic, such as the mean or the median, and then to see whether this statistic increases over the years (after this, you may want to perform a statistical test). Step 3: combine the results into a new DataFrame. This is the conceptual framework for the analysis at hand. 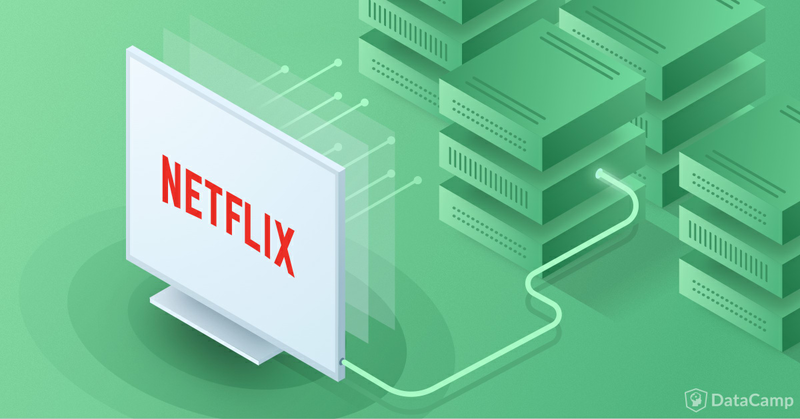 In this post you'll learn how to do this to answer the Netflix ratings question above using the Python package pandas. You could do the same in R using, for example, the dplyr package. I'll also necessarily delve into groupby objects, wich are not the most intuitive objects. The process of split-apply-combine with groupby objects is a pattern that we all perform intuitively, as we'll see, but it took Hadley Wickham to formalize the procedure in 2011 with his paper The Split-Apply-Combine Strategy for Data Analysis. If you find this technique useful, you can learn more about it (among many other things) and practice it in our Manipulating DataFrames with pandas course. 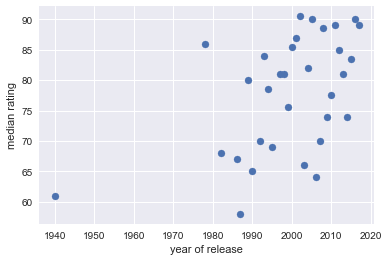 Here you'll use pandas, groupby objects and the principles of split-apply-combine to check out how Netflix movie ranges vary as a function of the year they were released. I originally came across the data on data.world here and you can also find it at here at The Concept Centre. You can find all the code in this post here if you would like to reproduce it. This looks pretty cool to me: you have titles, ratings, release year and user rating score, among several other columns. Before performing our groupby and split-apply-combine procedure, lets look a bit more closely at the data to make sure it's what we think it is and to deal with missing values. Note that there is a missing value NaN in the user_rating_score of the second row (row 1). 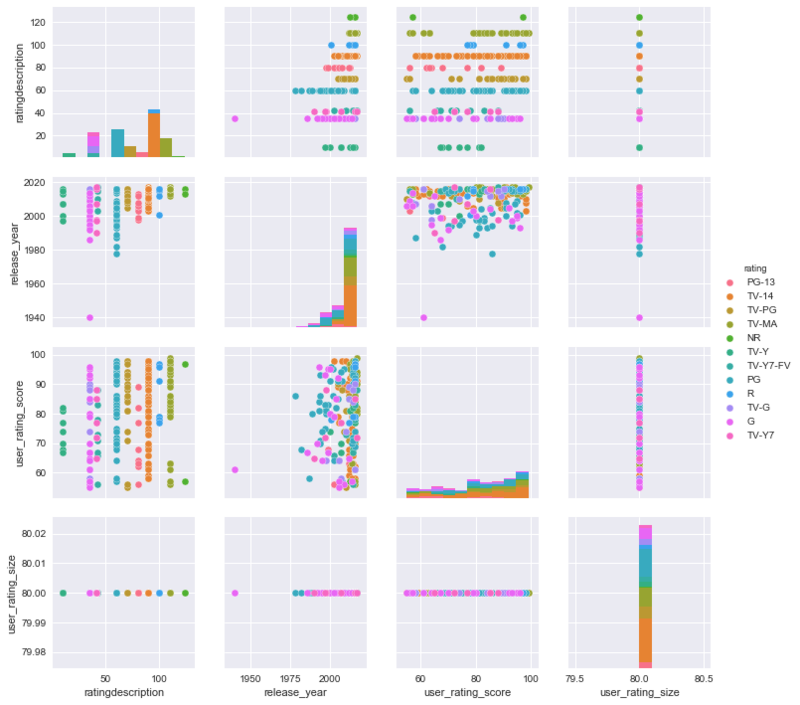 You can drop rows that have any missing values, drop any duplicate rows and build a pairplot of the DataFrame using seaborn in order to get a visual sense of the data. You'll color the data by the 'rating' column. Check out the plots and see what information you can get from them. 766         Balto      G  General Audiences. Suitable for all ages. Let's say that you wanted the mean or median user_rating_score for each year. Then you can apply the .mean() or .median() method, respectively, to the groupby object and 'combine' these into a new DataFrame. Looking at the figure, the median rating definitely increases over time. You'd need to leverage some more sophisticated statistics to convince me of the trend in general but this an example of Exploratory Data Analysis being a great starting point for further research. Groupby objects are not intuitive. They do, however, correspond to a natural the act of splitting a dataset with respect to one its columns (or more than one, but let's save that for another post about grouping by multiple columns and hierarchical indexes). The split-apply-combine principle is not only elegant and practical, it's something that Data Scientists use daily, as in the above example. To appreciate more of its uses, check out Hadley Wickham's original paper The Split-Apply-Combine Strategy for Data Analysis. If you have any thoughts, responses and/or ruminations, feel free to reach out to me on twitter: @hugobowne.